Jean-Marie D’aumont will try anything once, with consequences that are at times mouthwatering and at others fascinatingly macabre. Orphaned as a child, taken under the wing of a local nobleman and sent to an elite school for young gentlemen, Jean-Marie becomes an Enlightenment-era Zelig. He befriends Ben Franklin, corresponds with the Marquis de Sade and Voltaire, thwarts a peasant uprising, plays a key role in the Corsican War of Independence, and, among other feats, constructs the finest menagerie in all of Europe. Rising through the ranks of eighteenth-century French society, he feasts with lords, ladies, revolutionaries, and eventually kings. He is a father, a husband, a devoted friend, and an imaginative lover. But Jean-Marie’s every adventurous turn is decided by his obsessive quest to know all of the world’s flavors before that world changes forever. Set against the backdrop of the Enlightenment, the French Revolution, and the delectable decadence of Versailles, The Last Banquet is as gripping as Patrick Suskind’s Perfume and as voluptuous as John Lanchester’s The Debt to Pleasure. Jonathan Grimwood has given readers a sumptuous and hugely appealing novel about food and flavor, about the Age of Reason, about revolution, hunger, and obsession. Jonathan Grimwood has written for The Guardian, The Times, The Telegraph and The Independent and numerous other magazines and newspapers. The Last Banquet is his first work of literary fiction. He divides his time between London and Winchester. Jon Courtenay Grimwood signs The Fallen Blade. ; Catherine Webb signs The Neon Court: Or, the Betrayal of Matthew Swift. 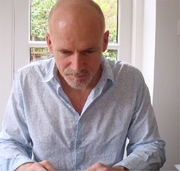 Jon Courtenay Grimwood is currently considered a "single author." If one or more works are by a distinct, homonymous authors, go ahead and split the author. Jon Courtenay Grimwood is composed of 12 names. You can examine and separate out names.